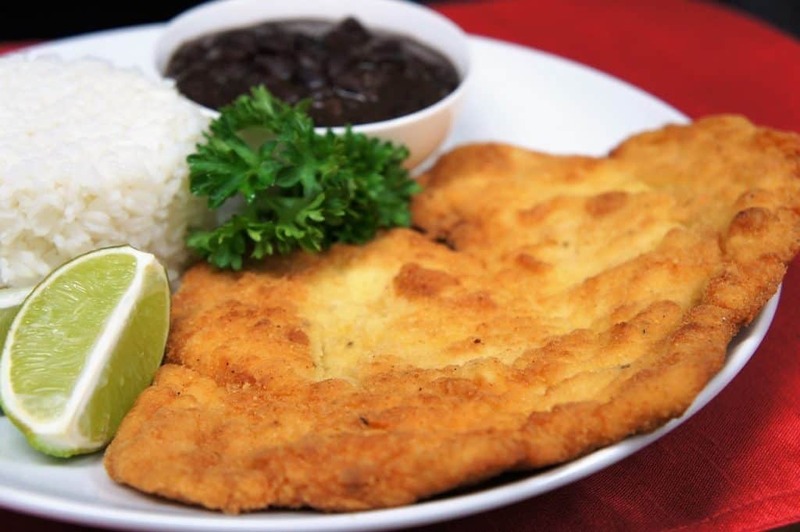 In Spanish this dish is called bistec de puerco empanizado, translation: breaded pork steak. 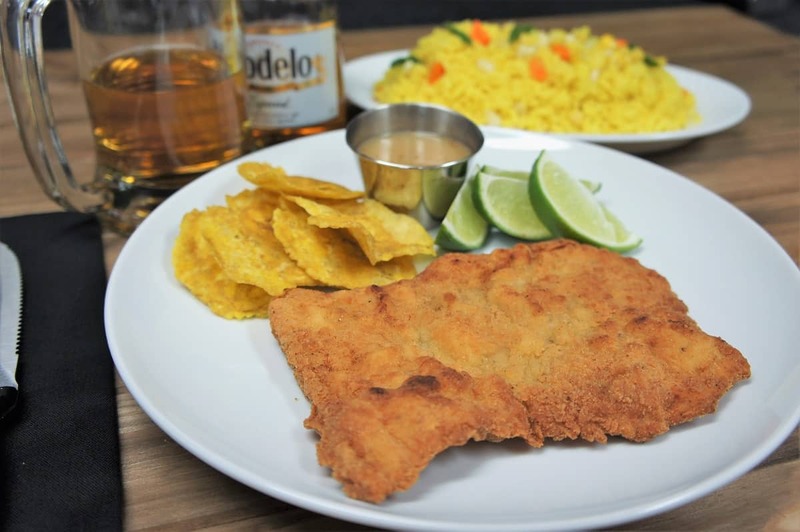 This breaded pork recipe is super easy and makes a great dinner. Breading the pork steaks takes a little time, but once that’s done, they fry up really quick. 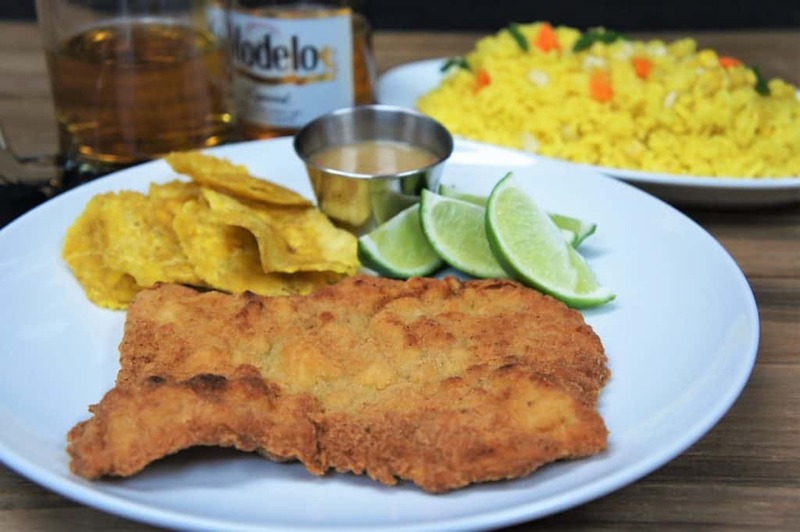 Here we serve the breaded pork steaks with yellow rice with mixed veggies, and store bought fried plantain chips. 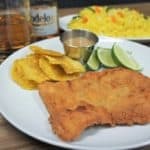 Add a couple of lime wedges to the plate and you have a delicious, Cuban-style meal in your own home. If you’re not able to find thin (or cubed) pork steaks, make your own. Start with pork loin pieces, lay one or two pieces on a cutting board and cover with plastic wrap. 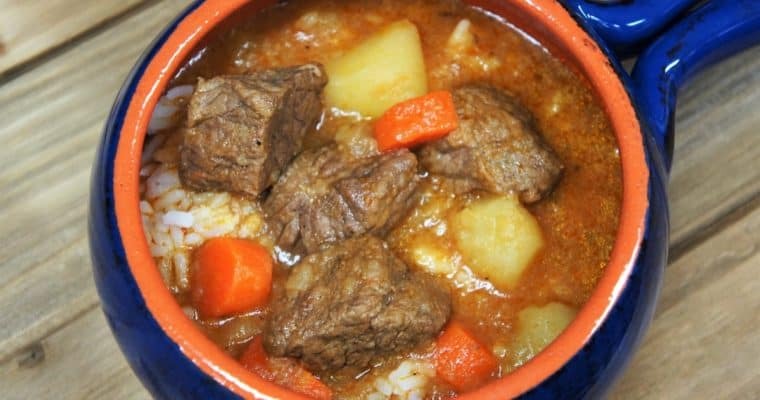 Pound each piece using a meat mallet until they’re about ¼ inch thick. Take care not to pound too hard or the pork may tear. Pound gently and consistently until the pork is flattened. Repeat with the remaining pieces. Add the salt, garlic powder, onion powder and black pepper to a small bowl and mix well to combine. Sprinkle the pork steaks on both sides with about half of the seasoning mix. Use a large baking sheet (or a large piece of parchment paper) add the flour to one side and the cracker meal (or breadcrumbs) to the other. Season the cracker meal with the remaining seasoning and mix with a fork. Add the eggs to a large bowl and scramble using a fork or whisk. Sprinkle in a pinch of salt. Working with one piece of pork at a time, lightly coat it in the flour on both sides. Shake off the excess flour. Next, dip the pork in the egg mixture. Make sure the pork is evenly moist. Now, place the pork in the cracker meal or breadcrumbs, make sure there’s an even coating and gently shake off the excess. Place the pork on a pan or plate and repeat with the remaining pieces. If you’re stacking the pork, use a piece of parchment paper in between so that the coating doesn’t stick to itself and flake off. 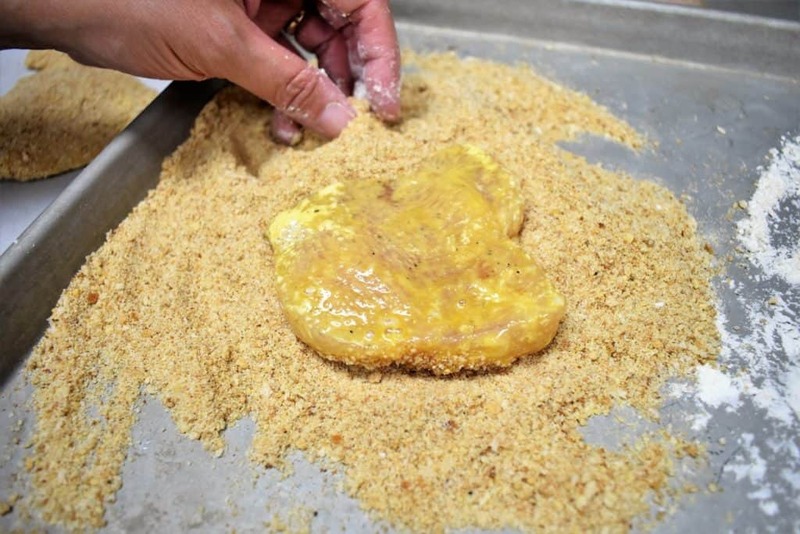 Get step by step, how-to dredging & breading instructions. Cover the bottom of a large, deep skillet with about a ¼ of an inch of oil. Heat the oil over medium-high. When the oil is hot, but not smoking, add 1 or 2 pieces of pork (depending on the size). Do not overcrowd the pan. Fry the pork for 2-3 minutes per side, turn and repeat until they’re golden brown. Use tongs to turn the pork so the breading does not flake off. Remove the pork from the skillet and place it on a baking sheet that is lined with a cooling rack. This will prevent the bottom of the breaded pork from getting soggy. 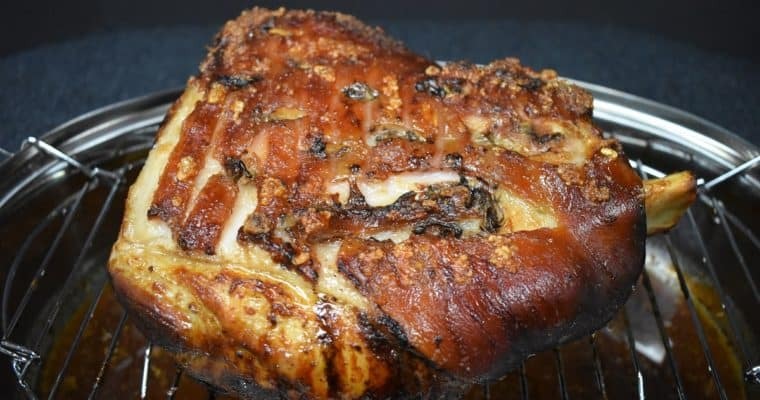 Keep the pork away from drafts to keep warm while you fry the remaining pieces. Serve the breaded pork steak with yellow rice and mixed veggies, or your favorite sides. Make sure the oil is hot before adding in the pork. I like to use a test piece to make sure the oil is hot enough. If the oil starts bubbling and makes a sizzle sound, it’s ready to go. Make sure sure the oil isn’t too hot. The coating will brown too quickly and the pork won’t get cooked all the way through. Use tongs to turn the pork so the coating doesn’t flake off. If the pork is browning too quickly, lower the heat a little bit. Turn the pork frequently to brown evenly on both sides. It might be necessary to lower the heat for the second or third batch. Just keep an eye on the pork and adjust the heat as needed. 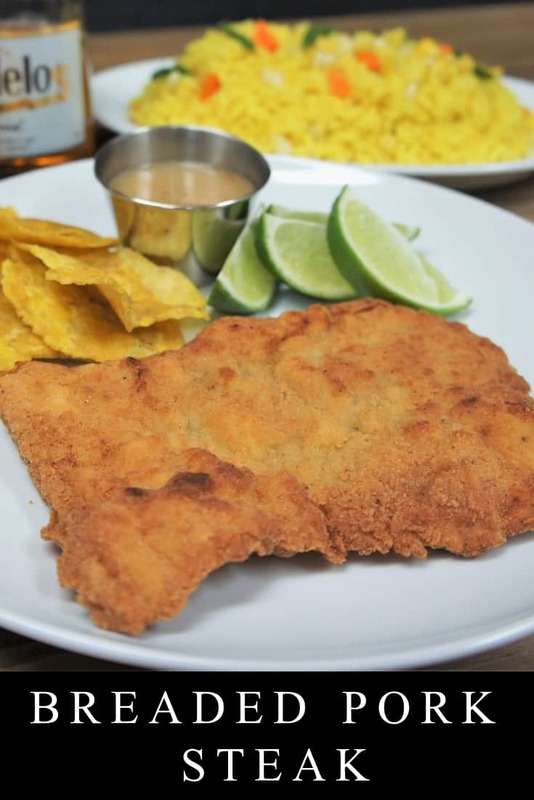 In Spanish this dish is called bistec de puerco empanizado, translation: breaded pork steak, and it’s super easy to make. Add the salt, garlic powder, onion powder and black pepper to a small bowl and mix well to combine. Sprinkle the pork steaks on both sides with about half of the seasoning mix. Add the eggs to a large bowl and scramble using a fork or whisk, sprinkle with a little salt. Working with one piece of pork at a time, lightly coat it in the flour on both sides, shake off the excess flour. Next, dip the pork in the egg mixture; make sure the pork is evenly moist. Now, place the pork in the cracker meal or breadcrumbs, make sure there is an even coating and gently shake off the excess. Place the pork on a pan or plate and repeat with the remaining pieces. If you are stacking the pork, use a piece of parchment paper in between so that the coating doesn’t stick to itself and flake off. Cover the bottom of a large, deep skillet with about a ¼ of an inch of oil. Heat the oil over medium-high. When the oil is hot, but not smoking, add 1 or 2 pieces of pork, do not overcrowd the pan. Fry the pork for about 2-3 minutes per side, turn and repeat until they’re golden brown. Remove the pork from the skillet and place it on a baking sheet that is lined with a cooling rack. Fry the remaining pieces.